Join us in welcoming back Don from EatSleepCruise! He’s treating us to his list of the best activities for families on Royal Caribbean's Quantum-class cruse ships! There is so much to do and see onboard Royal Caribbean’s newest ship, Anthem of the Seas, that it is an ideal vacation for families. Whether your family is the outgoing type, or likes to vacation in a relaxed, casual style, Quantum class ships offer a great mix of amenities and public spaces to please everyone from 2 to 92! If you vacation like us, we know you want to make the most of every minute. But, no matter how many days you are onboard a Quantum class ship, it seems like there is never enough time to get everything done. But, don’t stress. We have outlined the top 10 family activities for your next Anthem of the Seas trip to ensure you have the perfect family vacation. Soar to New Heights – Quantum class ships offer some amazing “firsts” at seas, among them are Ripcord by iFLY, a skydiving simulator, and North Star, an aerial gondola that takes you 300 feet above sea level. Both are must-do activities for families. While North Star is first come, first serve, you can make iFLY reservations in advance of your trip on the Cruise Planner! 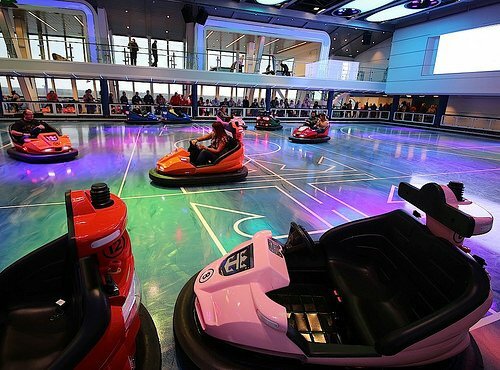 Have Some Four Wheeled Fun- The kids are in for a real treat on Anthem of the Seas as they can experience the first ever roller skating rink at sea. 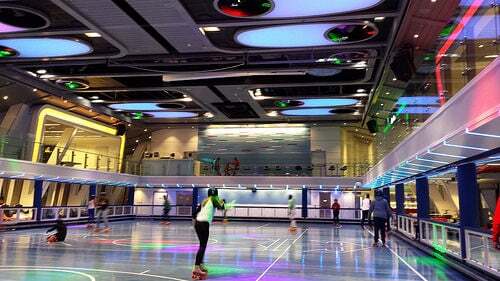 Some roller skating events have themes, like 70s disco night or 90s pop night, so check the cruise compass to find a time that will entertain all members of the family. Then, gear up for a rock and rolling good time! And, yes mom and dad you also have to get out on the rink! Throw your Own Personal Pizza Party – Most cruise ships have the same boring pizza selections: cheese, pepperoni, and that unidentifiable specialty pizza. However, Sorrento’s Pizza shop on Quantum class ships allows cruisers to make a fresh, custom pie by selecting from a wide array of toppings. So, while everyone else is at dinner, head to Sorrento’s with the kids, and let them be in charge of the menu one night. Go Head First into Oncoming Traffic – At the multi-use SeaPlex on Anthem of the Seas, there is so much you can do! 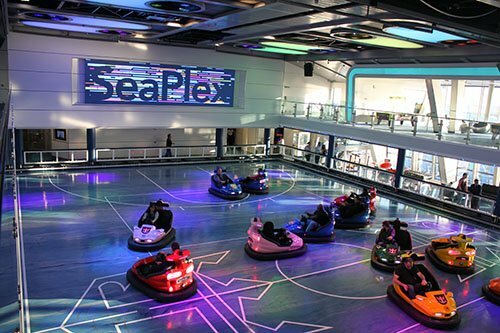 On several days of your cruise, this venue offers select times for you and your loved ones to let out a little aggression, safely, with some bumper cars. Don’t be fooled by the location, these cars are armed for a mighty good collision. Check the compass for times and restrictions as little ones do need to ride with a parent. Plan a DIY Scavenger Hunt – There are so many beautiful paintings, digital photographs, and sculptures onboard that Quantum class ships are like floating museums-don’t tell your kids that. So, you can create your own fun by hunting down some of these “rare artifacts” Indiana Jones style. See who can find the most pieces of art in a pre-determined time frame. Hint: the elevators are a great place to start. Sing Your Lungs Out – A cruise ship staple for young and old alike is karaoke. Happening at different times throughout your Anthem cruise, there are scheduled family karaoke sessions. So, why not get the whole family together for a sing-a-long? Who cares if your 13 year old daughter is embarrassed! Grab her hand and head up to the stage to “Shake it Off” along with Taylor Swift. Make a Memory – One of the untapped gems of Quantum class ships is The Workshop, a secluded space located in the upper level of Two70. With a variety of complimentary classes available, family members can work with cruise staff to create personalized scrapbooks for all those vacation memories. Even if you have never made one before, there is no better time than the present to start a new tradition. No previous experience is necessary; all you need to bring is your imagination and your DIY skills! And the kids get to play with glue sticks! Pose with Shrek – Not only Shrek, but many members of the Dreamworks family are onboard, and they want to meet you and the kids. During most sea days, there are scheduled “meet and greet” times to take pictures with all of your favorites, from Princess Fiona and Shrek, to Gloria and Alex from Madagascar, to the cast of How to Train Your Dragon. So, grab your camera and make sure to bring your smiles! Most of these “meet and greets” do allow you to use your own camera for pictures, whereas some of them are for professional portraits only, so check the compass for details. Stay in Shape – There are so many organized and unorganized fitness related opportunities onboard Anthem of the Seas that there is no excuse for not staying active during your cruise. Perhaps, just a walk around the sports deck every afternoon for some old fashioned “family time”. Or, you may want to up the ante by challenging your kids to a rock climbing race, or even a boogie board showdown on the surf simulator known as the Flowider. Remember, it will help work off some of those extra calories too! Make it a Family Movie Night – I know, the last thing you might be thinking on your Caribbean cruise is that you want to sit indoors for 2 hours to watch a movie. Well, lucky for you, Anthem has extra-large outdoor movie screens located on the pool deck, playing family friendly movies. Depending on the length of your cruise, there will probably be two or three different movies playing in rotation. With showings during the early evening, it might be the best time to snuggle up on a deck chair with your personal crew. Now, all you need to do is book that vacation and get ready for some family fun. If you need some help arranging your Quantum class cruise, our exclusive planning guide might best place to start! Chef Devin Alexander, known from the popular TV series "The Biggest Loser", is proud to open her restaurant onboard Royal Caribbean’s Anthem of the Seas. Putting flavor first, Chef Devin gives "healthy a 180" with guilt free dining at Devinly Decadence. The newest addition to Royal Caribbean’s fleet, Anthem of the Seas, has taken her maiden voyage and is welcoming thousands of passengers aboard this truly impressive vessel that blends technology, entertainment, dining and elegance into one. I’ve invited two of my friends that just sailed on Anthem of the Seas back to the podcast to bring you our roundtable discussion all about Anthem of the Seas, where we review everything the ship has to offer from stem to stern. Royal Caribbean's Anthem of the Seas is an impressive cruise ship and today, we have a great statistical look at Anthem of the Seas with this fun video. Enjoy! Royal Caribbean's Anthem of the Seas is packed with new innovations, entertainment and more technology than you can throw a stick at, but we spotted something pretty darn cool to look for onboard too: a "stowaway" piano player. Royal Caribbean Vice President of Entertainment, Nick Weir, came up with the concept for the "stowaway piano player" and it's yet another example of unique entertainment you can only find on a Royal Caribbean cruise. Do you want to find the stowaway piano player? Let us know be leaving a comment! Royal Caribbean hosted a spectacular naming ceremony onboard the world’s most innovative ship, Anthem of the Seas led by Godmother Emma Wilby. Wilby is a British travel agent who was selected for the honor in a singing competition for travel agents. 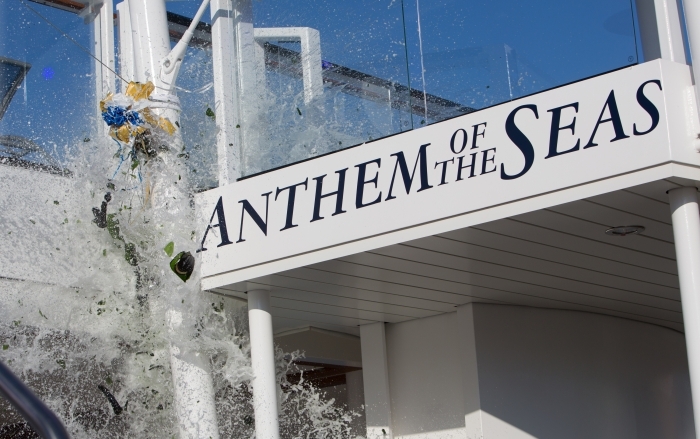 Royal Caribbean had its newest cruise ship, Anthem of the Seas, formally christened today at a ceremony in Southmapton, UK. At the naming ceremony, the ship's godmother, Emma Wilby, performed the honor of naming the ship and then pressed a button that released a bottle of champagne that broke across the ship's hull. Wilby, a travel agent that was selected to be the ship's godmother as part of a talent search, also sang the hit song "Firework" that was made famous by Katy Perry. Anthem of the Seas is hosting members of the media and other VIPs for a short 2-night cruise before she embarks upon her first regularly scheduled cruise on April 22nd. Royal Caribbean's Anthem of the Seas has arrived and it is already generating a lot of buzz and interest. She has a ton of amazing innovations, entertainment, dining choices and more, but what we really love is just how pretty she is, especially at night. Check out these photos of Anthem of the Seas after the sun goes down to get a good appreciation for Anthem's beauty when the lights come on. With Anthem of the Seas preparing for her inaugural cruise, we have photos from all over Royal Caribbean's brand new ship. Anthem of the Seas is sailing out of Southampton, UK through October, where she will sail to the Mediterranean and Canary Islands. Royal Caribbean has packed Anthem of the Seas with quite a number of intriguing onboard activities, restaurants and amenities. Later this year, Anthem of the Seas will reposition to Cape Liberty, New Jersey and offer cruises out of the New York area. Anthem of the Seas is the second Quantum-class cruise ship and is labeled as one of the most technologically advanced cruise ships ever. High speed internet, RFID technology, robotic bartenders and entertainment advances all make this ship a technological marvel.